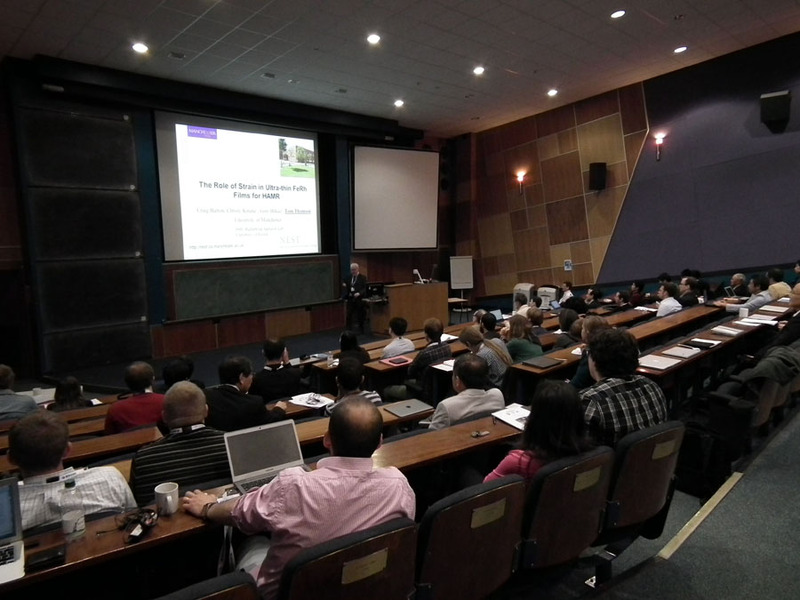 The symposium was held from 11-13 June 2015 at the Departments of Physics and Electronics, University of York. It was organised by Kevin O’Grady (York), Hideo Ohno (Tohoku), Burkard Hillebrands (Kaiserslautern), Koki Takanashi (Tohoku) and Atsufumi Hirohata (York). 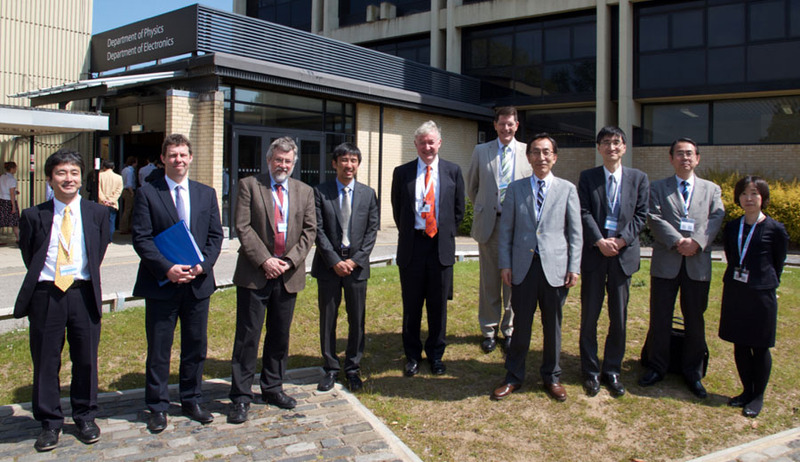 This was the seventh symposium between York and Tohoku Universities based on their cooperation agreement signed in 2006 and is now extended to include Kaiserslautern based on our recently awarded JSPS-EPSRC-DFG Core-to-Core funding. This symposium therefore served as a kick-off meeting for the Core-to-Core Project as well as the 3rd EU-JST HARFIR Open Workshop, including the Sir Martin Wood Prize Lecture. The symposium opened with a welcome address from the Dean of Science of the University of York, Professor Brian Fulton, and remarks from Professor Toshiya Ueki the Executive Vice-President of Tohoku University. A brief introduction to the Core-to-Core project was presented by Professor Kevin O’Grady. The first session focused on hard disk drives (HDD) with 5 invited talks. Prof. O’Grady introduced a new recording media for heat-assisted magnetic recording based on his model on exchange bias at ferromagnet/antiferromagnet interfaces. Prof. Muraoka (Tohoku Univ.) gave a talk on bit-patterned media for higher density recording, followed by a talk on a role of strain induced by FeRh layer in media by Prof. Thomson (Univ. of Manchester). Dr McCafferty from Seagate gave a review on HDD industry and Prof. Stamps (Univ. of Glasgow) concluded this session by introducing chiral materials to memory applications. After 15 min. break, the second session on organic spintronics was started with a talk on interfacial spin characterisation using He atoms by Dr Yamauchi (NIMS), followed by some examples on organic semiconductor/ferromagnet interfaces by Dr Pratt (Univ. of York). Dr Heutz (Imperial Coll. London) gave a talk on magnetic properties of phthalocyanines for device applications. 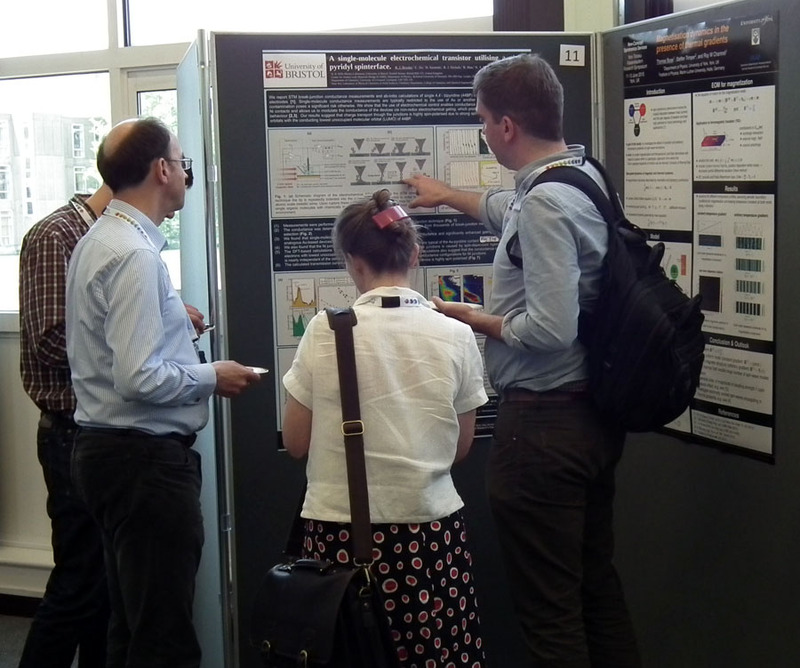 A poster session was held during lunch where no less than 29 posters were presented by students and post-doctoral research associates (PDRA) from many universities and by those academics who did not have invited talks but wished to present their work. Video presentations were also made by JSPS to provide their activities, including the Core-to-Core Programme. The afternoon session was started with domain-wall memories. Dr Hayward (Univ. of Sheffield) gave a talk on domain-wall manipulation using surface acoustic waves, followed by simulations on domain-wall displacement by Dzaloshinskii-Moriya interactions by Prof. Nakatani (Univ. of Electro-Commun.). Dr Vallejo-Fernandez (Univ. of York) then talked about a new wall-pinning method using exchange bias and Dr Greaves (Tohoku Univ.) gave the corresponding simulations. Dr Moore (Univ. of Leeds) discussed chiral domain walls in such memories at the end of this session. At the close of the first day, a session on high-frequency spintronics was held. Presentations were made by Prof. Hillebrands (Tech. Univ. of Kaiserslautern) on magnon transport in Bose-Einstein condensation, Prof. Mizukami (Tohoku Univ.) on high-frequency behaviour in Mn-Ga Heusler alloys, Prof. Mitani (NIMS) on magnetic tunnelling depending on interfacial properties and Prof. Kohda (Tohoku Univ.) on control of spin-precession frequency by anisotropic spin relaxation phenomena in a semiconductor. We continued our discussion over dinner at St Vincent Arms, while students and PDRA had their networking dinner at the city centre. On the second day, the latest development on magnetic random access memories (MRAM) was given by Prof. Ohno, followed by ultrafast switching behaviour in such memories by Prof. Dieny (Spintec). 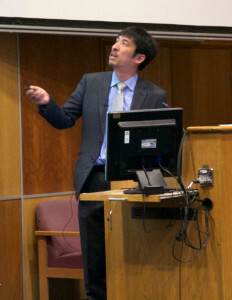 Prof. Shirai (Tohoku Univ.) then provided theoretical insight on the improvement of ferromagnetic layers in these memories and Prof. Oogane (Tohoku Univ.) gave experimental results on perpendicularly magnetised memories. After the tea/coffee break, the symposium continued with Sir Martin Wood Prize Lecture. Prof. Lamberts, the Vice-Chancellor of the University of York, addressed welcome, followed by a remark on the UK-Japan collaborations by Ms Kurata, Science Ataché, Embassy of Japan in London. Prof. Ohno gave a brief introduction of the Prize and the Lecturer, Dr Masamitsu Hayashi (NIMS). 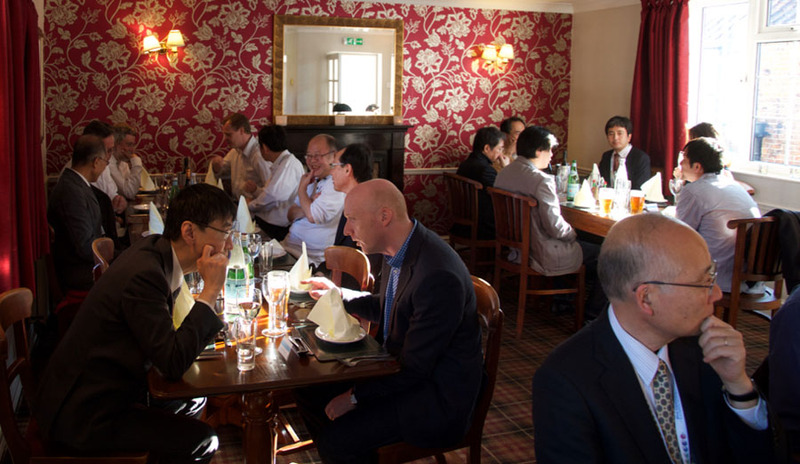 Dr Hayashi described the detailed mechanism of spin-transfer torque dynamics in magnetic nanostructures, followed by buffet lunch sponsored by Oxford Instruments. The afternoon session was on spin-current devices. The first session was started by Prof. Nitta (Tohoku Univ.) with talking about spin sensitivity amplification in (Ga,Mn)As/GaAs Esaki diodes. Dr Holems (Toshiba Cambridge Res. Labs.) gave the latest Ge-based spintronic devices and Prof. Dietl (Tohoku Univ./Polish Acad. of Sci.) presented the comparisons in spin dynamics using quantum and semi-classical approaches. Prof. Hirohata then gave a talk on spin-current amplification using a geometrical ratchet effect and Prof. Matsukura (Tohoku Univ.) discussed ferromagnetic resonance in Pt/(Ga,Mn)As under a DC voltage application. After the break, the second session on spin-current devices was began by Prof. Maekawa (JAEA) with his model on mechanically induced spin-polarised currents. Dr Wunderlich (Hitachi Cambridge Labs.) reported his recent achievement on domain-wall motion by pulsed laser, Dr Cavill (Univ. of York) presented his spin-resolved soft X-ray imaging on thin films and nanostructures and Mr Meyer (Tech. Univ. of Kaiserslautern) discussed spin-wave behaviour in Heusler alloys. The second day was concluded by Prof. Ohno’s remarks on the above 31 presentations. The last day of the symposium was dedicated to the EU-JST HARFIR project. Prof. Takanashi gave a brief introduction on the project, followed by his recent finding on exchange bias induced at antiferromagnetic Ni2MnAl/ferromagnet interfaces. Prof. Reiss presented similar effect at antiferromagnetic Ru-based Heusler alloys and MnN/ferromagnet interfaces. A guest speaker, Dr Mitsumata (NIMS), then discussed critical thickness of antiferromagnets using his model. Prof. Szunyogh (Budapest Univ, of Tech. and Econ.) provided his spin-cluster model to describe antiferromagnetic Heusler alloys. After a short break, the second session on Heusler-alloy junctions were started by Prof. Ono (KEK) with his recent results on X-ray and neutron characterisation of antiferromagnetic Heusler alloys. Dr Yames-Diaz (Univ. of Konstanz) discussed exchange bias estimated by their model and compared with experimental results as presented in the previous session. The second guest speaker, Dr Lazarov (Univ. of York) gave a talk on cross-sectional structural analysis on Heusler-alloy junctions, followed by a talk on topological insulating nature of Heusler alloys given by the third guest speaker, Dr Yan (Max Planck Inst.). The symposium continued with the last invited talk on MRAM for embedded memory by Dr Mahendra Pakala from Applied Materials, providing insight on the industrial applications in spintronics. The symposium ended at lunchtime. Attendance totalled 109 people, including 17 from the HARFIR project. The participants from outside the project were as follows: 62 from the UK, 6 from the EU, 16 from Japan, 4 from the USA and 4 from Hong Kong. Among these outside participants, 8 were from industry and 4 were from research institutions, which indicates that our activities have been attracting significant attention from application and fundamental research points of view. Having organised many previous workshops and been involved in the organisation of major conferences, the feedback from the participants regarding the symposium was of an extremely gratifying nature. The participants all commented on the amazing quality of the speakers in the programme and the general organisation of the event. Much credit for the latter must go to Mrs Susan Remmer, Professor O’Grady’s secretary, and Mr Robert Carpenter, who undertook the administrative duties. The organisers gratefully acknowledge the support from the EC and EPSRC which initiated the event. We are very happy to acknowledge the contribution of the sponsoring bodies JSPS, DFG, IOP and IEEE Magnetic Society and trust that future events of this scale and success can be arranged in the future.